Brandon Berry (right) wins Northeast Junior Welterweight title over Eric Palmer in this Oct. 12, 2014, file photo. Brandon “The Cannon” Berry will face what may be the biggest challenge of his professional boxing career Friday night when he battles undefeated Anthony “A1” Marsella Jr. in a six-round junior welterweight bout at the Twin River Event Center in Lincoln, Rhode Island. Berry, the pride of West Forks in northwestern Maine, is 13-3-2 with eight knockouts, including a TKO victory over Francisco Medel in his most recent outing on July 28 at Hampton, New Hampshire. The 30-year-old Berry, whose career was slowed in 2015 and 2016 by injuries that required three shoulder surgeries, will be fighting for the fourth time in 2018. He is 2-1 this year and 2-2-2 in his last six bouts. Friday’s fight will be a home game of sorts for Marsella, a Providence, Rhode Island, prospect who is 9-0 with four knockouts. Marsella’s last eight victories all have come at the Twin River facility for the CES Boxing promotion. Marsella, 23, who now trains in Las Vegas, rallied in his last fight on May 11 to score a split-decision victory over Ricardo Maldonado. Marsella suffered a cut over his eye before scoring a late knockdown to secure the victory. Marsella and Berry have one common opponent, Medel. Marsella defeated the Mexican-born fighter by unanimous decision Feb. 4, 2017. Injuries to two of the top fighters from the Portland Boxing Club have forced postponement of the club’s annual All-Star Boxing show originally scheduled for Nov. 10 at the Portland Exposition Building. According to PBC head coach Bobby Russo, undefeated pro middleweight Jason “The Fighting Fireman” Quirk suffered a work-related back injury and is sidelined for eight weeks. Also, super welterweight Casey “The Buzzsaw” Kramlich suffered a crushed femur in a work accident. Kramlich has undergone two surgeries to date and will need a bone graft, Russo added. Russo said some other New England fighters who would have appeared on the Portland card instead will compete at a world championship boxing show at TD Garden in Boston Oct. 20. The Boston card will be headlined by a WBO middleweight title fight between champion Billy-Joe Saunders (26-0) of England and challenger Demetrius Andrade (25-0) of Providence, Rhode Island. Veteran Portland middleweight Russell “The Haitian Sensation” Lamour, who is coming back from an injury suffered during his split-decision loss to John Thompson on last November’s All-Star Boxing card at the Expo, may return to action at the Oct. 20 TD Garden event, Russo said. 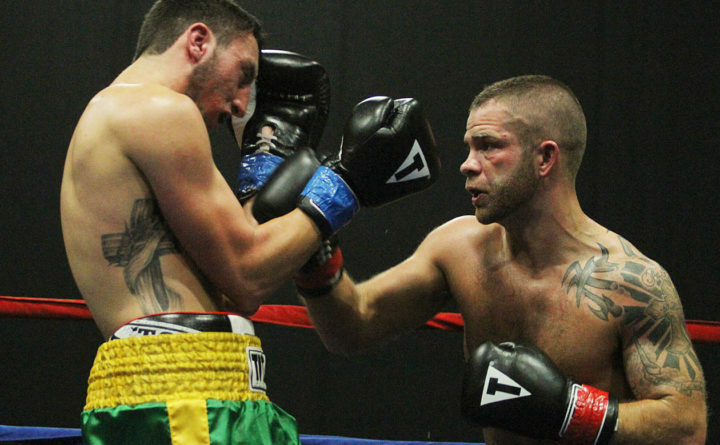 Justin Rolfe of Fairfield will attempt to build on his victorious debut in the professional ranks when he competes on a Nov. 21 boxing card at the Castleton Banquet and Conference Center in Windham, New Hampshire. Rolfe will face Edet Mkpanam of Brockton, Massachusetts, in a four-round heavyweight contest as part of a show hosted by Boston Boxing Promotions. Rolfe, a New England Golden Gloves heavyweight champion as an amateur, is coming off a technical knockout victory over Mike Hansen after the first round of their April 28 fight at the Skowhegan Community Center. Rolfe scored two early knockdowns before the fight ended. While Mkpanam will be making his professional debut against Rolfe, he went 8-3 as an amateur and won his weight class at the Marciano Tournament in 2017 and at the Southern New England Golden Gloves championships earlier this year.